He was not there and they let me know at the last minute when I was signing in. If I hadn’tasked if it was the same specialist or not I would’ve been paying the co-pay for a specialist instead of a general practitioner. He was not there and they let me know at the last minute when I was signing in. If I hadn’t asked if it was the same specialist or not Iwould’ve been paying the co-pay for a specialist instead of a general practitioner. I WAS VERY PLEASED AND THEY HAVE GREAT CUSTOMER SERVICE THESE ARE PROFESSIONALS AND YES I WOULD RECOMMEND THIS OFFICE TOEVERYONE. THEY NEED RAISES! I WAS VERY PLEASED AND THEY HAVE GREAT CUSTOMER SERVICE THESE ARE PROFESSIONALS AND YES I WOULD RECOMMEND THIS OFFICE TO EVERYONE. THEY NEED RAISES! Dr. Lawrence Manning, MD is an orthopedic surgery specialist in Alexandria, VA and has been practicing for 33 years. 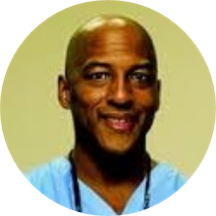 He graduated from Howard Univ Coll Of Med in 1980 and specializes in orthopedic surgery. THEY ALL NEED RAISES THEY WERE VERY PLEASANT AND I HAVE NEVER IN MY ENTIRE LIFE HAD SUCH GREAT CUSTOMER SERVICES FROM AN ENTIRE STAFF THEY ALL DESERVE AWARDS I WILL RECOMMEND THEM TO EVERYONE I KNOW AND TRUST ME IKNOW ALOT OF PEOPLE HIGH'S AND LOWS! STAY BLESSED BRIGHTSEAT HEALTH I THANK YOU FOR EVERYTHING THAT YOU ALL ARE DOING OUT THERE IN TEMPLE HILLS SEE YOU SOON! I feel the doctor did a horrible job or examining my issue and I think the job was very rushed and run through. They also did not have the "solution" to my problem in the office. Ultimately, I left the exact same way I came into the office. I booked an appointment with Dr. Manning based on the excellent care I received concerning a previous medical condition. As I expected, Dr. Manning initiated a treatment plan to resolve my current medical issues. The visit was good with Dr. Manning. The office manager and staff at the Temple Hill office is very disrespectful and rude. The rooms are very dirty and not suitable for patients. The wait to be seen by the doctor was long but understandable given the fact he is a 'surgeon' and was preforming post-op examinations and treatment. The appointment availability and practice location provided the most convenience for me.The staff was professional, efficient and cheerful in spite of my observation of 'patient irritability'. Dr. Manning is very pleasant and aminable. He talks to you and actually listens to what you have to say. Dr. Manning is a wonderful orthopedist, I will be referring all my friends and family to him. The only drawback I found is they don't accept Medicare. The hours are very convenient for those that work. Dr. Manning was very attentive, friendly, and knowledgeable. He was quick but thorough, and also took the time to answer all of my questions and concerns. Although the wait time can vary from time to time, my overall experience with this doctor and his office was very positive.